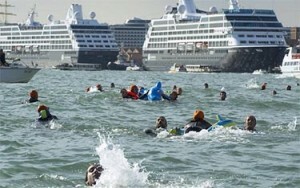 Headlines from NuovaVenezia: NO Big Ships! Two and half years after the tragedy of Giglio, these options are still on the table with no resolution. Now with no viable government in Venice as a result of the scandal of MOSE (which has incriminated so may elected officials) getting a decision is further hampered. 1) There is the excavation of the new channel Twisted requested by the Port, 2) The new channel behind the Giudecca (VTP and Undersecretary Zanetti), 3) the hypothesis Marghera for the huge ships, advanced by the City, with the ability to get to the Maritime digging the canal Vittorio Emanuele. 4) And finally, the solutions of the port “out of the lagoon,” the hypothesis Roar, Claut and De Piccoli asking to move the terminal to the Lido carrying cruise passengers with medium to large boats. 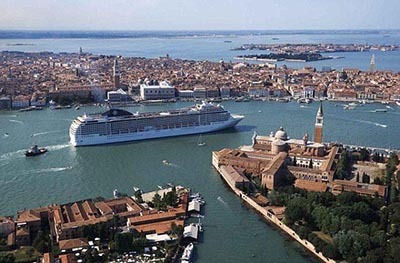 There are many facets to this problem, the politicans, the cruise industry, the port authority, and the many citizens of Venice who make their living serving the cruise lines. As you can see it all revolves around money! But who speaks for Venice? It is very complicated balancing the livelihood of citizens against the protection of this magical city, where they had the good fortune to be born. But what of their children if the city is ruined? Where will they work? Live? it didn’t have to have been. Agreed. This is a case where the privileges of a few (to arrive in Venice via a giant boat for the pleasure of viewing) endanger the city for everyone. Eventually, they will be banned. Hopefully, before some major disaster.